Pumpkin Bread: homemade pumpkin bread with a sweet maple glaze. Moist and lightly spiced pumpkin bread is an easy baking project to jump-start the fall season, just like these easy pumpkin hand pies. The simple batter comes together with little effort leaving you to enjoy the warm aroma that wafts from the oven as it bakes. 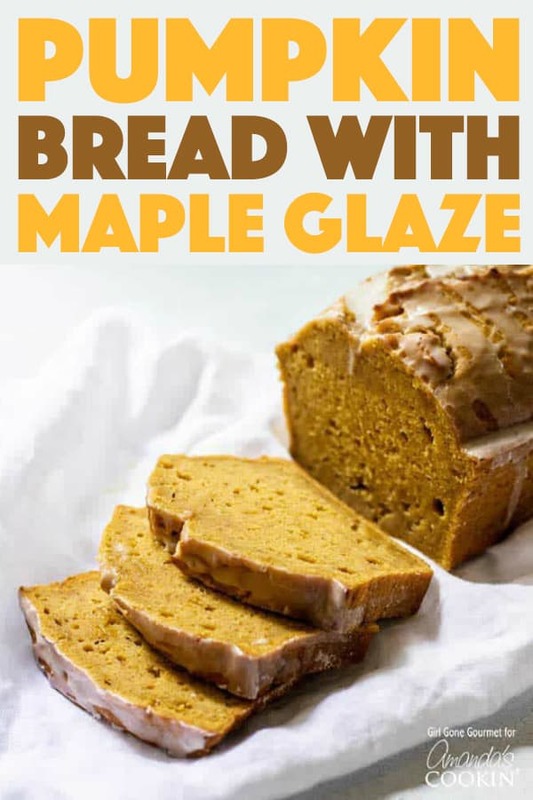 A simple maple glaze drizzled over the top makes it an extra special treat for breakfast or dessert. I’ve been welcoming fall since about mid-August (I’m an early adopter), but it’s not until I fill my kitchen with the scent of pumpkin spice that the season feels official .”Official” in the sense that I can, in fact, sip a warm drink while donning my finest fall layers while pumpkin bread bakes in the oven. 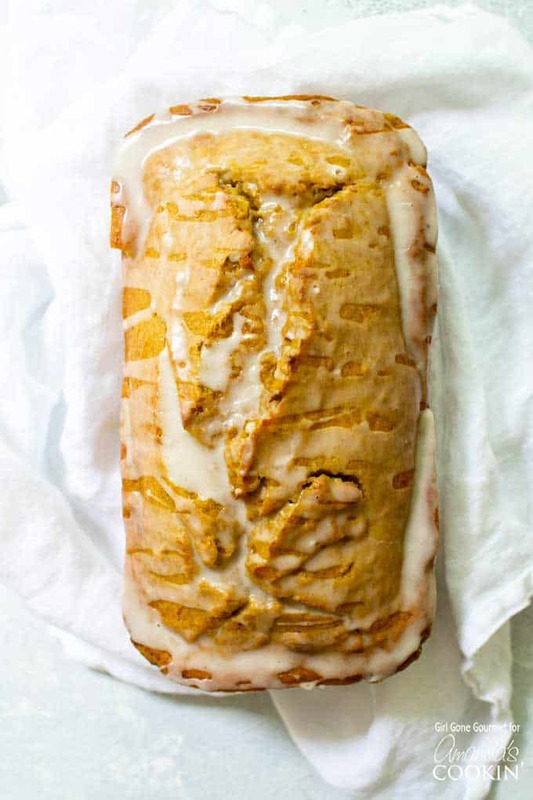 A pumpkin bread dressed in a sweet maple glaze is the epitome of fall. Pumpkin spice has become so associated with fall that it’s practically a cliche now. Pumpkin spice everything and everywhere! Despite my love for the season, I do draw a line with the famed mix of warm spices. I don’t buy into the pumpkin spice craze – no pumpkin spice lattes, candles, or French toast for me, thanks. I draw the line with just one fall spiced treat: Pumpkin bread. It’s a classic. Okay, maybe some pumpkin pie, too. But, that’s it! There have been many pumpkin bread recipes in my life most of which, while delicious, fell a little flat. It wasn’t until I tried my friend Rosemary’s lemon bread recipe that I learned the ratio of flour, baking powder, eggs, and butter that produces a towering quick bread that cracks open on top. I love that rustic look. So now, I use the base ingredient amounts from that recipe to create my own quick breads and it works every time. The batter is a low-maintenance operation. A quick whisk of the dry ingredients and a few stirs for the wet ones and a marrying of the two, mixing until they are just combined. From there the bread needs a good hour and ten minutes or so in the oven, which I suppose is a good opportunity to get things done. For example, like work or dusting or some other project, but I recommend taking a seat at the kitchen table with a magazine or other choice reading material and a hot drink. Half the reward in making pumpkin bread is the way it fills your house with warm coziness. You’re going to want to hang around the kitchen to take full advantage of the experience. Want more fall-inspired baking ideas? Be sure to check out my peanut butter banana bread, cinnamon apple coffee cake, and these peanut butter and chocolate muffins! 15-ounce can of pumpkin puree. Be sure it’s puree and not pumpkin pie filling. Spices: I use a pared-back spice medley of cinnamon, cloves, and nutmeg. Looking for more fall recipes to kick-start the season? 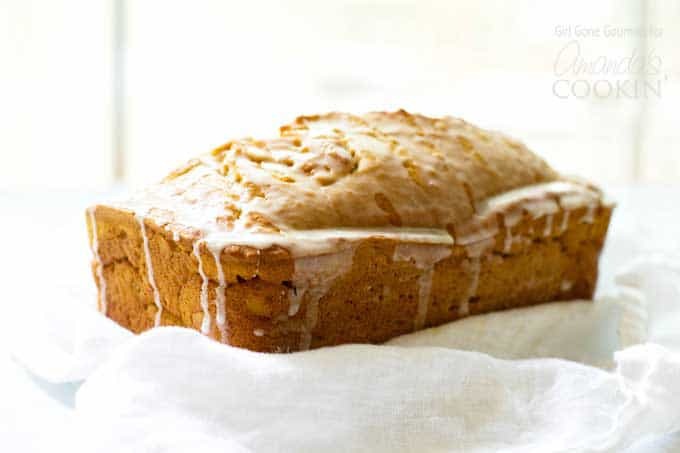 This spice cake may be the answer. The aroma that creeps through your home with this cake in the oven will have you hooked immediately. Another favorite is this easy baked apple crisp, a recipe that everyone will LOVE. If you have plenty of apples leftover from your apple picking outing, make a batch of this crockpot caramel apple cider. This caramel apple cider will warm you and all of your guests up on a chilly evening. It’s the perfect fall party drink! Two more recipes I’d like to share with you are my chocolate zucchini bread. This quick bread is moist, chocolatey and full of flavor! Or, this lemon zucchini bread with blueberries, it’s perfect for bringing to work for your coworkers or baking with the family. 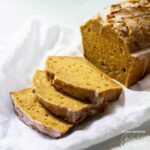 Moist and lightly spiced pumpkin bread is an easy baking project to jump-start the fall season. The simple batter comes together with little effort leaving you to enjoy the warm aroma that wafts from the oven as it bakes. A simple maple glaze drizzled over the top makes it an extra special treat for breakfast or dessert. Whisk the flour, baking powder, salt, cinnamon, nutmeg, and cloves in a medium bowl. 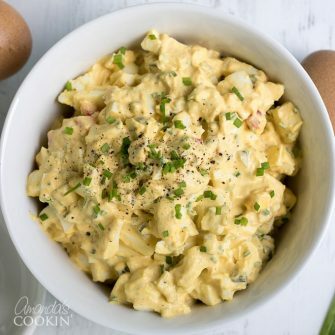 In a large bowl, combine the pumpkin, butter, sugar, eggs, and milk. Add the dry ingredients to the wet ones in batches and stir just until combined. Pour the batter into the prepared loaf pan. Bake at 350 degrees for an hour and ten minutes, or until a cake tester or toothpick comes out clean. Cool the bread in the pan for 15 minutes before removing it and transferring it to a wire rack. For the glaze: Combine the sugar, syrup, and milk together in a small bowl until smooth. Once the bread is cooled, drizzle the glaze over the top (place a sheet pan under the cooling rack to catch the excess glaze.) Let the glaze set for 10-15 minutes before slicing and serving. I made this recipe today & was very disappointed that it was a flop. I did notice that there wasn’t any baking soda. I compared to other pumpkin bread recipes, that was the only missing ingredient. Sorry it didn’t work for you! Without knowing exactly how you made it I can’t offer any advice, however baking soda will not break this recipe. Have you made this with buttermilk at all? I’ve got 2 qts to use up (event it was bought for cancelled) and would like to use some of it in my baking instead of freeing all of it. I’m thinking a small addition of baking soda or lemon juice would be needed to accommodate the buttermilk?